Fourth in a series on relationships; a view of the world as unified, with each person taking a responsibility. Anna Cox Brinton (1887-1969) was born in College Park, California, a suburb of San Jose. Her grandparents, Joel and Hannah Bean, had founded the College Park Meeting, an independent meeting whose success provided an example for the emerging spirit of Liberal Quakerism. Anna’s own experience in that region prepared her to exert her own influence on the Society of Friends and the world at large. She attended Stanford University, eventually earning a PhD from that school. During her years at Stanford, she also gained valuable service experience, as her family was one of the few able to provide succor to neighbors devastated by the great earthquake of 1906. 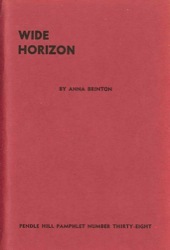 After receiving her PhD, Anna went on to teach at Sweet Briar College for three years, before leaving for the Friends’ World Conference in London in 1920. Afterwards she helped with the feeding efforts in Germany and Eastern Europe following the end of World War I. She met Howard Brinton when they traveled together in that region to coordinate feeding efforts. Here her classical training came in handy, because the Rector of Konigsburg University refused to negotiate with her in English and she had to use her knowledge of Latin. She returned to San Jose betrothed to Howard Brinton, and the two were married in 1923. After their marriage, they taught at Sweet Briar and Earlham, before receiving two appointments at Pendle Hill in 1936. Howard served as the Director of Studies while Anna directed administration at Pendle Hill, while raising four children. She covered housekeeping, the budget, negotiations with guest speakers, lecturers and teachers, and editing of pamphlets and bulletins. In 1950 she accepted a position at the American Friends Service Committee, where she worked and served as a pillar of the personnel committee. Most of her career, however, was spent at Pendle Hill, where her service continued until her death in 1969.